The Secret's Out! Lowest Score Wins has been lowering golfer's scores an average of 5 strokes per round. What can it do for you? Every aspect of shooting lower scores is covered in a way never before done. 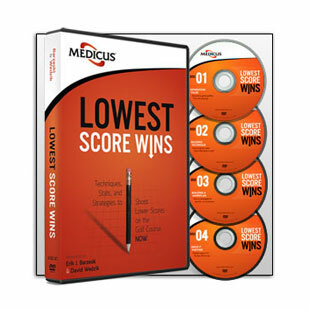 Each disc of the DVD set can be viewed independently to immediately allow you to lower your scores. Lowest Score Wins puts common golf myths to rest and introduces Separation Value: this shows you the key areas that have the highest impact on your score, and how to guide your practice for immediate improvement. When you master Separation Value - and the teachings that go along with it - then it's only a matter of minutes before you master the problems that have baffled the pros for years. 4 discs of innovative golf techniques, stats, and strategies. Puts common golf myths to rest. Reprioritizes practice for instant improvement on the course. Instruction by Erik J. Barzeski and former Tour Pro David Wedzik. Approximately 155 minutes of instruction. It will lower your golf score in just minutes! A must-have for every golfer!